Hi there - I have a question regarding the editorial reproduction rights surrounding album art/LP covers. Any info gratefully received, particularly any bits of related legislation I can use to back it up if needed. I am in the UK btw - but would be looking to license images worldwide. Any use beyond the purposes of research or private study would not be fair dealing, and any commercial use would invalidate the research purpose, so again invalidating the fair dealing principle. In order to do what you want to do, you would need to get permission from the current rights holder in each case, which is likely to be the record company, or its successor in title if the original record company has ceased to exist. Given the fact that music rights are valuable commodities, it should be relatively easy to discover the current owners of the intellectual property rights by contacting the copyright collecting society for recorded music, Phonographic Performance Ltd. (PPL). Even if they don't represent the actual record company or successor, they should be able to direct you to the correct rights owner. If after a diligent search you are unable to discover or locate the current rights owner you can request an 'orphan works' licence from the Intellectual Property Office for works which originated in the UK. More details on this process here. Thanks for your response Andy - does the album art count as 'design' or 'art' and therefore does the copyright attached to it expire after a certain time? For example 70 years after the creator's death as with photography, or is it 25 years for design/artistic works??? Sorry, yes, I should have qualified what I meant by artistic work. It would indeed be a copyright work and so the duration of the copyright is the life of the author or artist plus 70 years. That's why it is unlikely that any but the earliest works (from the 1930s) are out of copyright. If you are certain that the author of the sleeve died prior to 1944, then the copyright may have expired, as prior to 1995, the term in the UK was the author's lifetime plus 50 years, but it becomes considerably more complicated if the sleeve was first published elsewhere within Europe, especially if the country of origin was Germany or Spain. US copyright introduces another level of complexity. I imagine the early 'LP's were all shellac 78s with brown paper sleeves. But even if there is no artwork, like the one below, there could be copyright in the text which counts as a literary work. 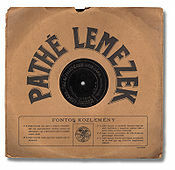 Image Credit: Hungarian PathÃ© Record by Mediatus <a rel="license" href="http://creativecommons.org/licenses/by/3.0/"></a>This work is licensed under a <a rel="license" href="http://creativecommons.org/licenses/by/3.0/">Creative Commons Attribution 3.0 International License</a>. Thanks for clarifying. I'm still a bit baffled though - when I search 'LP cover' in picture libraries e.g. on Alamy I came across hundreds of examples of scanned album art, some of it not even that old really. Would they have had to get the permission from all the rights holders in each case in order to make the scans available for editorial licensing? Theoretically yes, but I'm sure quite a few of the images you've found don't not have permission, and because either the owner isn't actively looking for infringements, or is not concerned about enforcing their rights, and so the images go unchallenged. It's a risk, but not an uncommon approach, typified by the maxim: "If it's a good idea, go ahead and do it. It's much easier to apologize than it is to get permission." -- Grace Hopper (1906 â€“ 1992). Thanks Andy. Seems odd that a well established company would take that risk. So if they hadn't cleared the rights before hand - then this is in actuality a copyright infringement? ie licensing the scans for editorial use? sorry forgot to add... or is it down the the licensee to seek permissions? "Prior Rights" means any previous licence or other right granted for the use of that Image. Where an Image has previously been Licensed by Alamy and then deleted from the System, Prior Rights include those previous Licences by Alamy. 4.3 Where the contract is entered into by an agent on behalf of the Copyright Owner the agent has the full authority of the Copyright Owner to enter into this contract. 4.4 You hold the rights to grant, market, license, sell or assign all rights in the Images, including but not limited to the rights to grant reproduction rights in the Images for digital media, print, motion picture, television, video, cable, computer, radio, cartoon, merchandising and/or Internet, to make the Images available on electronic equipment, and other similar media or via the Internet, and to include them in any catalogue, Internet sites or marketing in any form ("the Rights"); Except for the Prior Rights (if any) there is not and will not during the term of this contract be any fetter on Alamy licensing each Image to a Customer to the fullest extent possible. Paragraph 5 of the terms and conditions indemnifies Alamy against any claims from third parties. 5.2 Alamy makes no other warranty, express or implied, including, without limitation, any implied warranties of merchantability or fitness for a particular purpose. Neither Alamy nor its contributors shall be liable to you or any other person or entity by reason of any representation (unless fraudulent) or any implied warranty, condition or other term, or any duty at common law, or under the express terms of this Agreement for any loss of profit or any indirect, special or consequential loss, damage, costs, expenses or other claims (whether caused by the negligence of Alamy, its servants or agents or otherwise) which arises out of or in connection with this Agreement, even if Alamy has been advised of the possibility of such damages, costs or losses. Alamyâ€™s maximum liability arising out of or in connection with your use of or inability to use the Image/Video (whether in contract, tort or otherwise) shall, to the extent permitted by law, be limited to five (5) times the value paid by you for the relevant Image/Video. While these terms may provide Alamy some wriggle room with regard to their obligations to the licensee or end user, they would offer no protection against a claim by the legal owner of copyright who would be entitled to sue Alamy both on the grounds of possessing or dealing with infringing copy (section 23) and also for authorising another to carry out an infringing act (section 16(2)). Obviously were this to occur, Alamy themselves would in turn invoke paragraph 5 against the contributor. There would be a good case for a licensee in such circumstances, maintaining that he/she had no reason to assume the images were supplied without the correct permissions, and so they might avoid being liable for damages. (see Section 97(1)). Incidentally, you have mentioned editorial use a couple of times. The actual use of the images is immaterial. It is infringement whether it is done for commercial purposes or not, with the only exception being the fair dealing for the purposes of research and private study I referred to earlier. I'm not sure if the reference is because 'editorial use' appears in a few places in Alamy's terms and conditions or whether it is possible that you are confusing copyright law with the right of publicity laws which apply in some US states and a few other countries, where a person's image rights are not (normally*) infringed by editorial use of an image of them. * In a number of jurisdictions a right to privacy may outweigh a claimed public interest in publishing an image of a person for editorial purposes, eg Weller v Associated Newspapers Ltd  EWHC/QB 1163. Thanks for the details. When does album art go out of copyright though? I thought I had answered that question, in part at least, in my posting at 4.10pm of 9 April. If the artwork was created in the UK, the basic rule is 70 years from the end of year in which the artist died. If the artist died before 1944 then the work is likely to be out of copyright under UK law, because the old term which applied then was 50 years after death, and the new +70 year rule only applied from 1995. For works that originate from the US the rules are incredibly complicated (see this website for instance), but the good news is that as long as your use of the digitized artwork, and you yourself, remains in the UK, then the maximum term which will apply is the UK maximum even though the US term may be longer. However if a copyright owner in the USA decided you had infringed his copyright (because the US term meant the work was still in copyright there but not in the UK) you could face a civil legal action in the US if you ever went there on a visit. So long as you remain outside the jurisdiction of the US courts you can ignore their copyright terms.